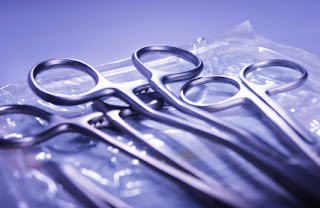 The packaging of medical devices and supplies such as test kits for doctor's offices, blood supplies, instruments, and containers presents a challenge for sterilization, preservation, and extended shelf life. Sterile packaging is a crucial factor for medical technology and devices but the packaging must also be optimal for transportation, storage, and end use. Medical supplies and devices are constantly being transported from office, hospital, or clinic to labs, or from suppliers to buyers where they are stored until needed for use. It is imperative to maintain a sterile atmosphere within the medical supply and device packaging during transportation and storage - right up until the moment the package is opened for the end user. Often, a medical supply being packaged is perishable and must be preserved at it's freshest state for the duration of the transportation and storage. The challenge here is to maintain sterility, freshness, and shelf life so as to preserve the integrity of the product, to get the most accurate test results, and to extend the shelf life of medical devices and supplies. Nitrogen gas is a clean, dry, inert gas used effectively for sterilization, preservation, and atmosphere blanketing. Nitrogen provides an ideal solution to the challenges presented in medical device packaging. Nitrogen may be applied during medical device packaging to eliminate the presence of oxygen. If oxygen comes into contact with perishable medical supplies, it may affect the nature of the product as well as any test results associated with it. Nitrogen displaces the oxygen and maintains a dry, sterile atmosphere within the packaging. Also, by eliminating oxygen, Nitrogen gas will prevent humidity levels which can affect the shelf life of stored medical devices. A Nitrogen Generator is a safe and reliable way to administer N2 gas for medical packaging. Especially when compared to high pressure cylinders, a Nitrogen Generator is cost effective, easily manageable, produces high purity N2 gas on-site and on-demand, and won't ever run out of gas. Using a simple PSA Generator or Membrane Generator technology, a Nitrogen Generator is the best solution for sterile medical device packaging. South-Tek Systems engineers and manufactures Nitrogen Generators for a number of different industries including medical packaging. Contact South-Tek Systems today to learn how they can help you cut costs, increase efficiency, and provide an effective solution to medical device packaging: 888-526-6284.